Santiago, Aug 12 (EFE). 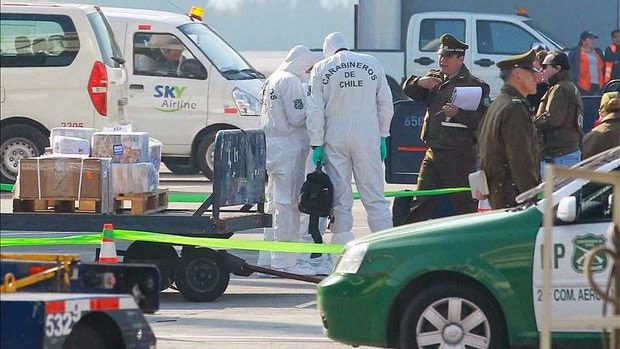 — A group of gunmen made off with a haul of as much as 6 billion pesos ($10.5 million) the largest in Chilean history in an assault on an armored car at Santiago International Airport. Eight masked gunmen, pretending to be workers, entered the cargo area of the airport minutes before 6:00 a.m.
Once there, they threatened the Brink's guards who were getting ready to load the money on a plane that was going to fly it to the northern part of the country. Once they had the loot in their power, the assailants sped away in two cars that went in different directions, one taking the expressway that leads from Santiago to the coastal city of Valparaiso while the other took a local road. On their way, witnesses say, the gunmen scattered sharp spikes on the road to make the police chase more difficult. Later a burned car was found on the local road, thought to be one of those driven by the assailants. This heist recalls another that occurred at the same place in April 2006, when six robbers attacked a Brink's truck and stole some $2.1 million in Chilean and U.S. currency. Authorities eventually caught up with the perpetrators in that case and they are all serving time in prison.